Designed for the woman who is a non-traditional student, age 35 or older, we help transform lives. Our HER Scholars are pursuing their first Bachelor’s Degrees with a goal to obtain the tools and skills they need to achieve economic security. 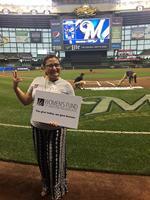 Thank you Milwaukee Brewer’s Wives! What an amazing night! We are grateful to the Brewer’s Wives who support our HER Scholarship program and recently helped recognize the eleven HER Scholars of the 2017/18 academic year. 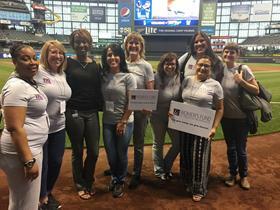 These women stood on the field at Miller Park and celebrated their incredible achievements…five earned their degree either in December or May. 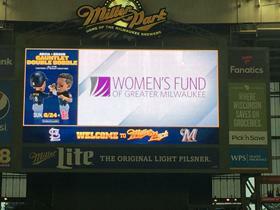 As they stood together before the Brewer’s home game on June 21, each of them was introduced with their faces featured on the jumbo screen. The cheers and applause from baseball fans throughout the park were humbling for all. The Brew Crew went on to beat the Cardinals. There was lots to celebrate that night…we are humbled. Thank you! What’s a Bachelor Degree Worth? Josefina knows! Josefina is one to celebrate. Josefina had a dream to be a teacher and with the help of a HER Scholarship, she has achieved her goal! She has been working as a Bilingual Special Education assistant for eleven years and as a Regular Education assistant for two years. After four and a half years of school at UW-Milwaukee, she now has a Bachelor of Science in Education with certification in early childhood and bilingual education. With the degree in hand, she was able to accept a position as a Dual Language First Grade teacher at Bethesda Elementary School in Waukesha. That’s what a degree is worth…the opportunity to be a classroom teacher. Congratulations Josefina…good luck in your new role! in July and your gift is matched. The next group of HER Scholars for the academic year of 2018/19 will be announced in August.